Mmm pizza. We love pizza. It’s Abby’s favorite food…it’s Kyle’s favorite food…it may be my favorite food. Ha. I grew up with my dad working for Pepsi at Pizza Hut for 15 years. Actually, my parents met at Pizza Hut! My mom was a waitress and my dad was a manager. You could say I’ve had my fair share of pizza in my life. Plus my brother worked at Papa John’s a year or two in high school and my sister has worked at Volcano’s for quite a few years now. So when it comes to eating pizza, it must taste good! 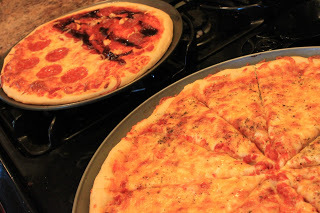 I have worked at perfecting my pizza crust and continue to do so. We can’t afford to go out and get pizza every week but we like eating pizza, let’s be honest, at least 2 times a week. So making it saves SO MUCH money. It costs me about $2.40 to make a large pizza. 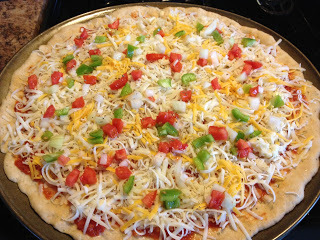 When we were first married I bought frozen pizzas (before I knew not to) and we liked the Meijer ones. So now I decided to make my own frozen pizzas. With Kyle home a lot of days now working I have to keep him eating here instead of going out to LC (Little Ceasars). So bam! Homemade frozen pizzas it is. Super easy. 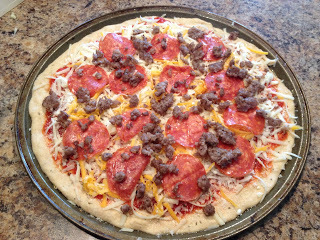 Make your pizza up and then stick it in the freezer for about 20 minutes at least to get it hard. Take it out and put foil over it and put back in freezer. Preheat oven to 400 when time and stick it in straight from the freezer. Piece of cake! 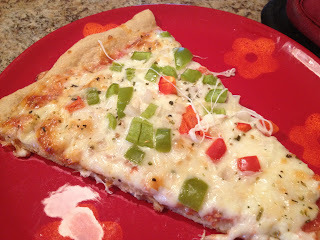 If you’re interested in my current pizza recipe then let me know and I can post a recipe. Can I say I’m a little bit obsessed with my Nutribullet? Well I am. My favorite so far…..
Holy cow…..YUM. Even my picky husband and BIL, Erik, liked it. Spinach also fights against ovarian cancer, prostate cancer, cardiovascular disease, protects brain function and prevents aging. Still need motivation to eat a few servings of spinach every day? This dark green leaf will protect your brain function from premature aging and slow old age’s typical negative effects on your metal capabilities. Spinach accomplishes this by preventing the harmful effects of oxidation on your brain. Those who eat a vegetables in quantity, especially those of the leafy green variety, experience a decrease in brain function loss. However, there is no such correlation with fruit consumption. Oh, and iceberg lettuce doesn’t cut it. A good rule of thumb: the darker the leaf, the better. Which brings us back to spinach. 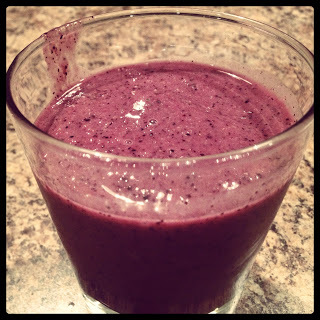 This is all in 1 cup of spinach….which is contained in that smoothie I made! I love learning about foods God made for us. So eat your spinach because it’s loaded with amazing benefits! Next PostWhy do I use Flaxseed? Oh, how I love spinach! 🙂 Didn't know though that it is rich in vitamin K2. Great info. Do you freeze them and then take them off the pan so you still have your pan available?